Unleash Your Primal Powers to Gain Confidence, Strengthen Relationships, Claim Respect, and become a Pack Leader of People. Part self-help book and part deeply personal memoir, Pack Leader Psychology tells the revealing personal story of how I learned to become a pack leader to my dog and how those same ideas completely transformed my personality and improved my relationships with people. I quickly realized that this simple, but powerful, universal idea I called Pack Leader Psychology™ could help others. and maybe even become a pack leader of people! Pack Leader Psychology recounts the lessons I learned while becoming a pack leader to my dog, Reilly, that helped transform me from a submissive, abused wife into a calm, confident, independent and assertive human pack leader. As odd as it sounds, I discovered eye-opening parallels between Cesar Millan’s “Dog Whisperer” dog training concepts and human behavior. I saw that just as dogs develop anxieties and misbehaviors when they lack pack leaders, so do humans. Just as dogs, when threatened and fearful, react with fight-or-flight and dominance and submission in the pack hierarchy, so do humans. Because the explanations are rooted in elemental concepts that will resonate with readers, the content forms an easily understood model for human relationships. These concepts offer simple, yet powerful explanations about human behavior that readers can immediately apply to all relationships in their lives. Just as I did, you can effortlessly transform yourself into a calm, assertive pack leader of people! The book helps readers intuitively understand why they behave as they do, become more emotionally healthy, and identify and predict the behaviors of others. The book started many years ago as a memoir, so it contains many personal stories from my experiences in life and dog training. Each chapter starts with a lesson from Reilly and of elemental wisdom of animals. I then weave in stories from my life with the latest research on human social and evolutionary psychology. Pack Leader Psychology offers deeper explanations for human behavior than other self-help books, but is easy to understand and a quick read. In addition, the book simplifies the hundreds of psychological “disorders” into just a few key categories and concepts. 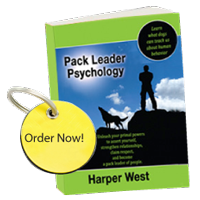 Pack Leader Psychology™ is available on www.barnesandnoble.com or www.amazon.com. If you like what you read, I’d really appreciate if you’d go back to either site and leave a review. The more reviews I have (and higher ratings!) the better it is for my efforts to get the book out to other readers. Thanks!